Peck Lake is about 20 miles north of Lake Worth (where we anchored for most of the month of January, when I had MRSA). The charm of Peck lake is it’s protected anchorage and close proximity to the ocean. It is so close, we can hear the ocean from our boat. What a pleasant sound, and it’s the only anchorage we’ve found with such an amenity. For that reason, this anchorage quickly became one of our favorites. According to the forecast, it looks like it will be at least a week before we will get a weather window to cross the Gulf Stream, so we opted to stay here for awhile before going to Lake Worth, using the inlet there to make our crossing to the Bahamas. 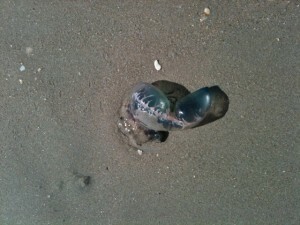 Man of War on the beach looks like a beautiful bubble, but it's poisonous. After White Swan and Lady Bug were securely anchored in a shallow part of Peck Lake, the five of us (Ed, Cheryl, Gary, myself and Molly) went to the beach on the ocean side. 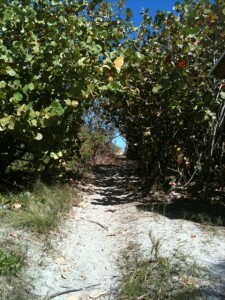 There are two paths from Peck Lake that cut through the Hobe Sound Preserve (which is approximately ¼ mile wide) allowing access to the ocean’s beach. There is a water shuttle from a nearby community continually making rounds to bring people back and forth to the entrance of the path. 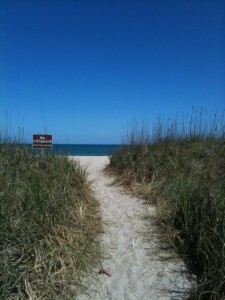 The beach is several miles long, accommodating the small groups of visitors. Gary and I went to the ocean everyday. Gary went early in the morning for his power walks and then accompanied me later in the afternoon for a less vigorous walk and time sitting on the beach. I enjoyed getting my feet wet while walking the shore with Gary. He enjoyed an occasional swim in the ocean. Much of our time at Peck Lake was spent with each boat’s occupants doing “their own things”, but we had happy hour on Lady Bug the first night we were here, and Cheryl prepared a delicious dinner for all of us the next night. She realizes I’m not up for reciprocity quite yet, but our time to host gatherings will come. We also went to the beach together a couple of times. Occasionally, Gary went with Ed to walk Molly. 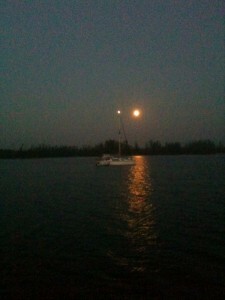 One night while I was talking on the phone to our boating friend, Pat, she told me to go out and look at the moon because it was a “supermoon”, which happens only once in every 18 years. The moon is closer to the earth than usual and looks larger and that is why it’s called a supermoon. 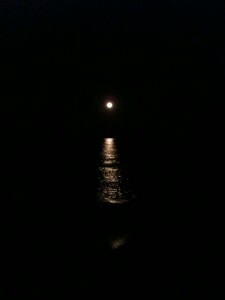 I wanted to see it shine over the ocean, so Gary and I hopped into the dinghy, in our pajamas, and went to the beach. It was worth the effort and there were quite a few people on the beach enjoying the spectacular view. 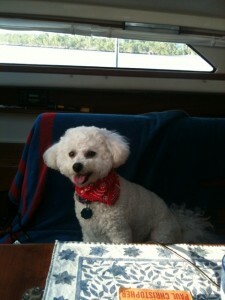 Molly stayed aboard White Swan while the guys caught those floppy ol' fish. While fishing with Ed and Molly the last night we were at Peck Lake, Gary caught a flounder big enough to keep so he cleaned it and it is in the fridge, awaiting our pallets. When Gary put the flounder in the dinghy, Molly was okay until the fish started flopping, at which time Gary had to catch Molly to keep her from jumping off the bow of the dinghy. Ed and Gary hurriedly motored the dinghy to White Swan to show me the flounder and they decided they better leave Molly with me. I enjoyed her company and cute doggie antics while the guys finished their fishing for the night. Thus ended our relaxing, pleasurable stay at Peck Lake.